Description: The Contrast Bracelet features Vertical Larks Head knots that face different directions. 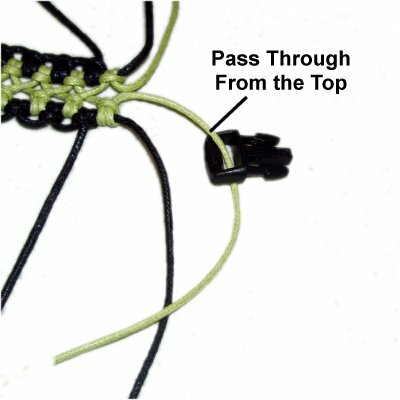 It's important to use two contrasting light and dark colors for this Micro-Macrame bracelet design. Waxed Cotton was used in the example shown, but Leather can be used as well. Flexible materials are not suitable for this design. 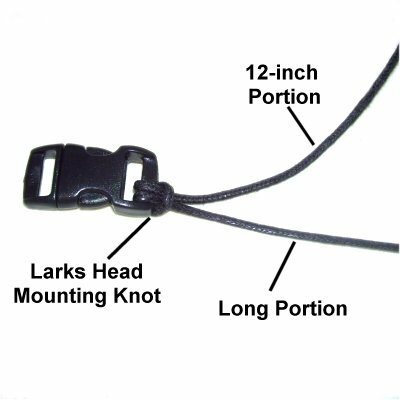 The clasp used in this design is a clip, but other clasps can be used. 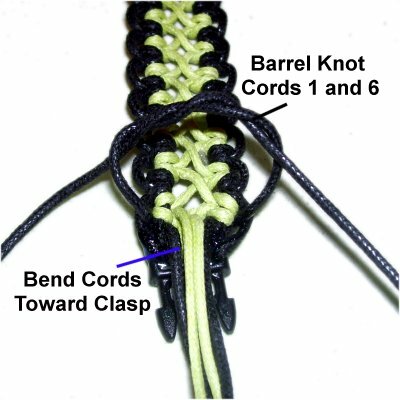 You can switch to a sliding clasp, by starting the knots in the center and working in each direction. 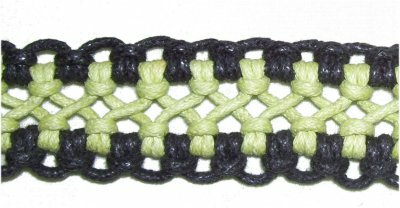 This Macrame pattern is rated Easy, suitable for beginners. Preparation: When using waxed cotton or similar material to make the Contrast Bracelet, prepare the ends to prevent unraveling. Leather needs no preparation. Subtract the length of the clip, which is usually around 1-inch. The result is the finished length of the bracelet. Multiply the finished length x 13, and cut 2 cords of Color A to that length. Multiply the finished length x 8, and cut 1 cord of Color B to that length. Step 1: Fold one Color A cord 12 inches from one end. 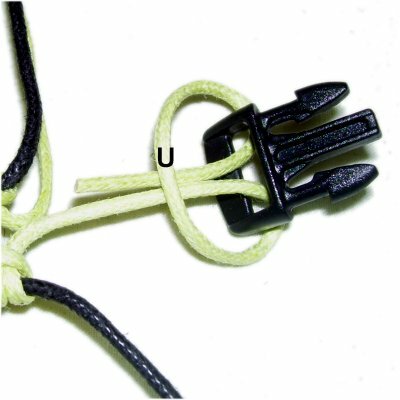 Pass the ends through the space on the clip and under the folded area (Larks Head knot). The LONG portion should be on the outside, as shown in this image. Mount the other Color A cord in the same manner, making sure the long portion is on the outside. The 12-inch portions are the holding cords. Fold the Color B cord in half and mount it between the other two cords. Step 2: Mentally number the cords 1 - 6. Secure cords 2 and 5 so they have tension (12-inch segments of the dark cord). 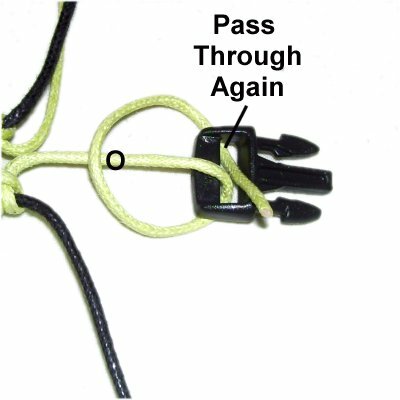 Pass over - under holding cord 5. As you pull it left, pass the end over cord 4. 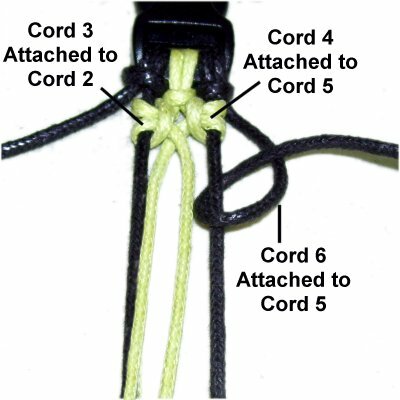 To make the second half of the knot, use cord 4 to make a loop, under - over cord 5. As you pull the end left, pass under cord 4. 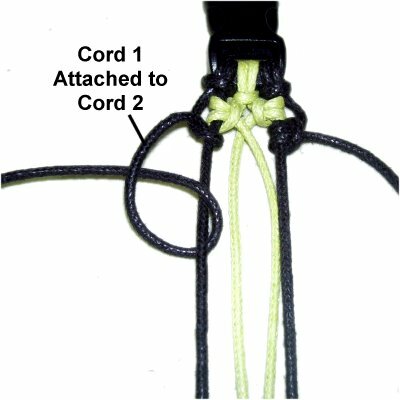 Step 3: The next knot is tied with cord 3, which is attached to holding cord 2. The two loops are tied in a clockwise direction. 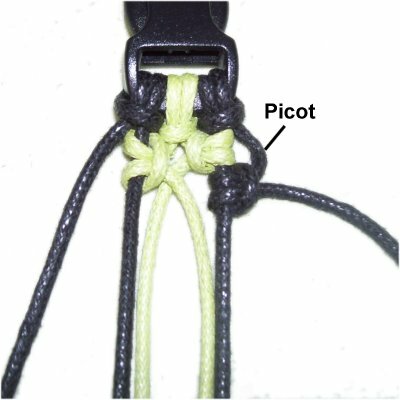 Tie the following knot with cord 6, attaching it to holding cord 5. Rotate clockwise when making the two loops. 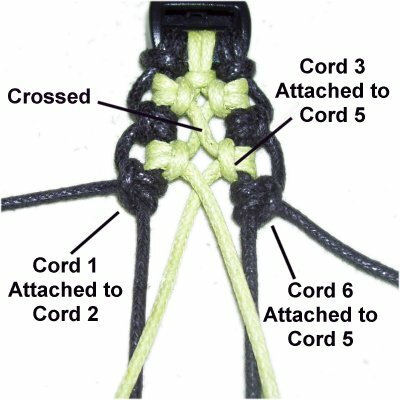 While tightening the knot made with cord 6, loosen it in the area above the knot. This forms a picot, which will match the others that form as you progress. 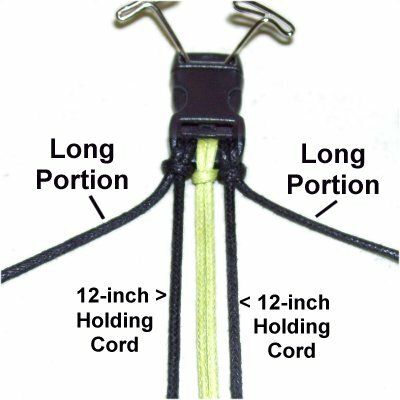 Step 4: Attach cord 1 to holding cord 2 with a Vertical Larks Head knot, rotating counter-clockwise. 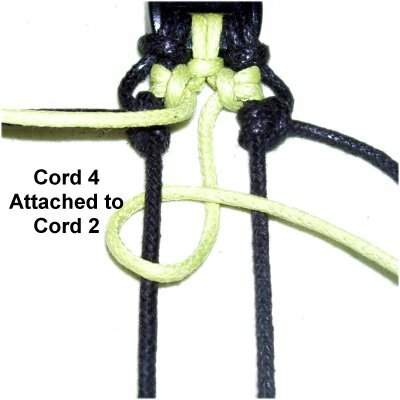 Cord 4 is attached to holding cord 2, so it crosses from right to left. Always start with this cord, so the crossing is the same throughout. 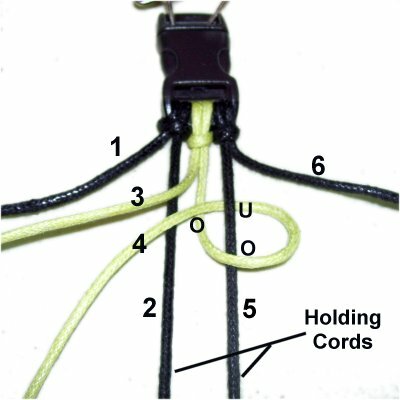 Step 6: The next knot is tied with cord 3. Cross left to right, and attach it to holding cord 2. Attach cord 1 to holding cord 2. Attach cord 6 to holding cord 5. Step 7: Repeat steps 5 and 6 several times, until the Contrast Bracelet is the finished size you need. Remember to take into account the length of the clip when you measure. The other half of the clip needs to be attached to the loose ends. The following steps show the best way to do this, but are optional if you prefer a different method. Place the bracelet on your left. Pass one Color B cord through the clip from the top (front to back). Cross the end over the portion coming from the bracelet, forming a clockwise loop. Then pass it through the clip again, but this time from back to front. Pass the end under the segment next to the loop, to complete the Larks Head knot. 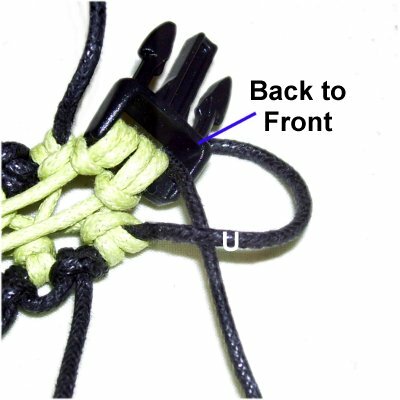 Remove all the slack as you tighten, so the clip is close to the knots in the bracelet. Step 8: Repeat step 7 with the other Color B cord. Pass the end through the clip from back to front, and then under the segment coming from the knots. Turn over the bracelet, and bend cords 2 - 5 towards the clasp. Apply a generous amount of glue to secure them in place. Do not put the glue on the clasp. 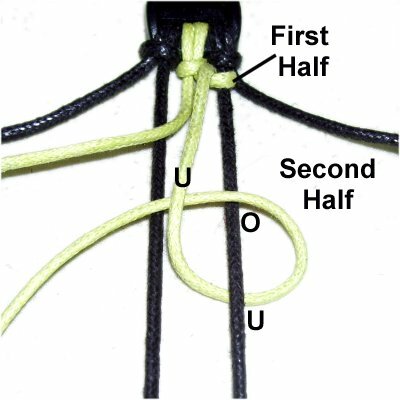 Tie a Barrel Knot with cords 1 and 6, tightening it so it rests on top of the other cords. Apply glue. After the glue dries, cut off the excess material. This image shows the detail for the Contrast Bracelet. Have any comments about the Contrast Bracelet? Contact Me.